While young men still commit a disproportionate share of crimes, it appears crime rates among the elderly are increasing in some countries. Rising poverty rates among the elderly are being blamed. Consider the “Opa Bande” (“Grandpa Gang”)—Bloomberg Business tells of three German men in their 60s and 70s who were convicted in 2005 of robbing more than one million euros (US$1.09 million) from 12 banks. At their trial, the members of the gang testified that they were trying to top up their pension benefits. One defendant said he used his share to buy a farm where he could live because he was afraid of being put in a retirement home. 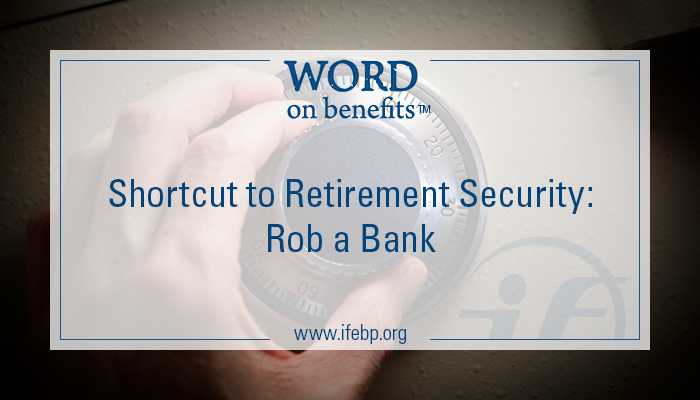 Fortunately, the overwhelming majority of workers who move into retirement with insufficient funds to provide the life they envision will not be turning to crime. But stories of elderly crime draw much-needed attention to the importance of planning for retirement security. It is more likely seniors will cut their living expenses and, perhaps grudgingly, accept that the final years of their life will not be all that they had hoped. There may be children or other family members who will step in and provide assistance in the form of housing, money and so forth. It is predicted many will attempt to close the gap between their retirement income and expenses by working longer. Employment in later life is making a comeback, with an increasing number of persons staying in the workforce past what is considered the normal retirement age. This increase in labor force participation is expected to continue. While some workers view working longer as a positive, this is not true for everyone. Some who are working will be disappointed they have neither the time nor the money to enjoy their later years as they had hoped. Of course, another difficulty is that not all who want to work may be able to do so due to poor health, a lack of job opportunities or other factors. Retirement for persons who cannot find work may be filled with financial challenges, mental stress and an unwelcome dependence on others. For workers doing manual labor, personal health and safety may become an issue. Beyond concern for the financial well-being of retirees, are there other reasons employers, plan sponsors and plan administrators should be concerned about the retirement security of workers? Yes, and here are a few reasons why. Limited opportunities for younger workers. Those persons who delay retirement affect the ability of employers to hire and retain younger workers. Less productivity. There are a number of reasons for waning productivity as workers age (e.g., poor physical health, a decline in cognitive abilities, failure to keep up with rapid technological changes). The extent to which productivity decreases depends on the individual and the type of work they do. While the education and experience of older workers can make up for some or the entire decline in certain abilities, the probability of a decline in abilities still rises as workers age. Workers who have no choice but to continue working are more likely to be less engaged and perform poorly. Additionally, younger workers unable to move up the career ladder may be less motivated to optimize their own productivity. Higher compensation and compensation-related costs. Older workers have higher salaries and wages that lead to high costs for payroll and compensation. At some point, pay continues moving upward while productivity declines. The value of a worker’s production may even be less than pay—especially when the cost of benefits is factored in. Increased health care costs. In general, older workers have more health issues than younger workers. As the workforce ages, the health issues of older workers have an increasing financial impact on the cost of health benefits. Longer and costlier workers’ compensation claims. Older workers have fewer accidents in the workplace, but their injuries are often more severe. Older workers also take longer to recover from their injuries. More severe injuries and longer recovery mean higher workers’ compensation insurance fees charged to those employing these workers. Higher absenteeism. Put in the simplest terms—As workers age, workers take more sick days. For strategies that employers, plan sponsors and administrators can use to help workers achieve retirement security and make working longer a positive scenario for both employers and employees, read: The Path to Retirement Security in Canada: How Employers and Plan Administrators Can Help.